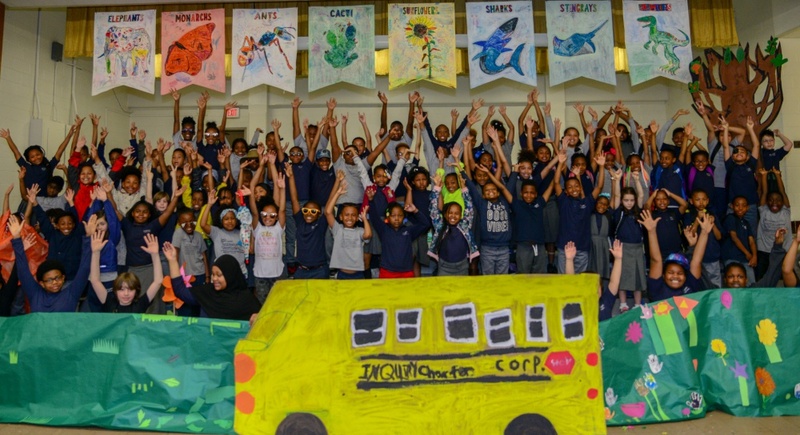 This month, Inquiry’s 2nd and 3rd graders performed a fully self-produced musical production. Since the start of the school year, students have been working with Miss Anna in music class to write original songs about each of the seasons. Miss Anna guided the classes as they wrote the lyrics and selected the chords for the songs as the seasons came and went. The show really started taking shape as students imagined and created the sets. They constructed buildings, trees, plants and other colorful backgrounds. Once props were collected from home, it was time to take the stage! The 2nd and 3rd grade classes performed for their fellow Inquiry students and again for parents. Mr. Bob even made a guitar-strumming cameo. Everyone agreed the show was a hit! You can listen to the original songs written and performed by Inquiry students on our soundcloud page. We hope you love hearing our music as much as our students loved writing it!